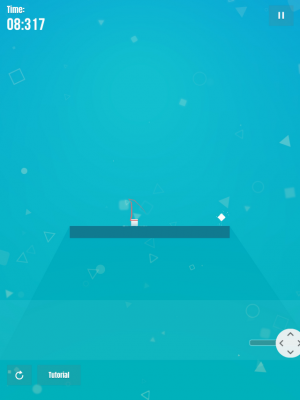 Almost There [Free] is a very interesting platformer in the sense that it is designed to be played with one hand. I was playing the game on a regular 9.7”-sized iPad and it was a bit awkward at times, but if you play it on an iPhone you may have an easier time with the controls as they are designed to be played in the portrait orientation. The game supports both standard or right-handed players and left-handed people via a mode you can switch on in settings. To reach the end of the course, you have to hit this ball of light (sphere or orb). You play the role of a cube as you swipe your way across 55 levels. The game’s art direction, and overall aesthetics, are very tranquil and surreal. It has a neon light vibe to it with geometric shapes moving around in the background. The graphics are pleasant, but repetitive. Almost There is free to play and at first I thought that it offers very unobtrusive IAPs. These IAP’s, which you can purchase inside the ‘shop’ will allow you to unlock additional level ahead of time. 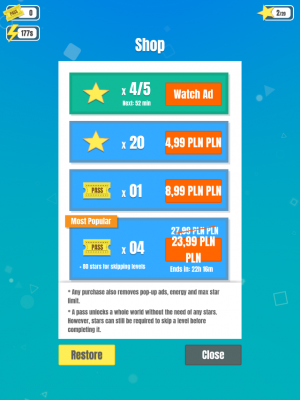 The game’s progression is measured by stars, which you can purchase in various bulks. You can also earn stars by progressing throughout the levels yourself and the faster you progress, the more stars you earn. As long as you pass to the exit you get a star and depending on your speed, you can earn up to two additional stars. To access the next level you will have to pay a single star. Oh and did I mention you can always watch an ad for a star? However, as I kept playing I realized that the game also has this weird energy system and not just stars that may halt your progression. After a while you will either have to make an IAP or watch an ad to overcome the energy roadblock and progress deeper into the game. These nags aside, the game is not a micro-transaction hell by any stretch of the imagination. Because I was playing on the iPad’s larger display, I felt the best way to control the game was via the thumb rather than the forefinger. This may be natural for iPhone users, but many of us iPad gamers use our forefingers in a lot of games. Either way, the game is very playable on the touchscreen. The one thing that is a bit annoying with the control scheme is that in order to do a long jump you will have to run for a while in one direction until you see a split-second flash, and this can be a bit disorienting. It is easy to jump too quickly and fall because you will have to wait for this flash to know you have reached the appropriate speed burst to jump. Once you get used to this, it all blends together well as usually it hits by the time you reach the ledge’s edge anyway. You will have to sometimes go backwards, or left, when on a platform to have enough room to speed up for these kind of long jumps. However, if you have been playing platformers over the years, like Mario with its run button, it should be second nature. The other thing to note about the game’s control scheme is that you can actually cling onto the side walls and, as you slowly fall, wall jump in the opposite direction. This skill takes some practice though as your finger will be shifting back and forth to fling to specific spots through the slider. Almost There is a pretty challenging platformer. The game is not too dissimilar from titles such as Super Meatboy, but the control scheme really makes it stand out. The challenge in a way has more to do with mastering the strange and different control method, however, rather than the level layout. 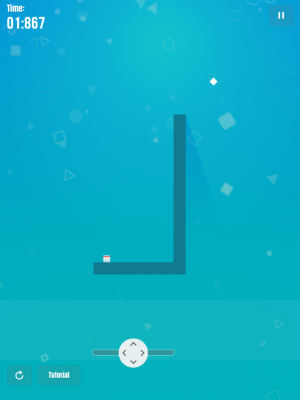 But the level layout is not bad at what it aims to do: give you a nice challenge mastering obstacle courses with jumps, runs and quick finger actions (letting go of the finger at the right time while flinging above a platform or sideways from a ledge). The game has a lot of small nuances like this that separate it from most other platformers, besides its one-finger control scheme. It has variations to its gamplay, which is nice, as well as descent level design. Almost There’s title has a lot of truth to it. This game is really almost there in being a touchscreen-defining platformer. It controls well, is challenging and fun to play. It’s just too bad it is a bit on the short side and offers little customizability — especially with the slider. If you could lower the slider intensity, it would be as playable on iPad as other iOS devices. It still plays well however, once you get used to its quick and how different it is from a standard platformer with four directional buttons or on-screen icons. If you are looking for an additional platformer to add to your collection or a game you can play with one hand while standing in line, Almost There will fit that role nicely. How do four indie devs make two great games a month?